Will Lauren Bacall Live On in Advertising? Yesterday, Hollywood lost one of its last Golden Age actresses. The glamorous, sultry Lauren Bacall was 89. She was known for her films with co-star-turned-lover-turned-husband Humphrey Bogart (To Have and Have Not, The Big Sleep, Key Largo) as well as her throaty voice, a trademark that bode well for advertising. With the passing of a Hollywood icon of Bacall's stature comes the question of what will happen to her personification. Will Bacall's image continue to be used in advertising like Marilyn Monroe and Audrey Hepburn's have been? Adweek put the question to the agency and branding world. 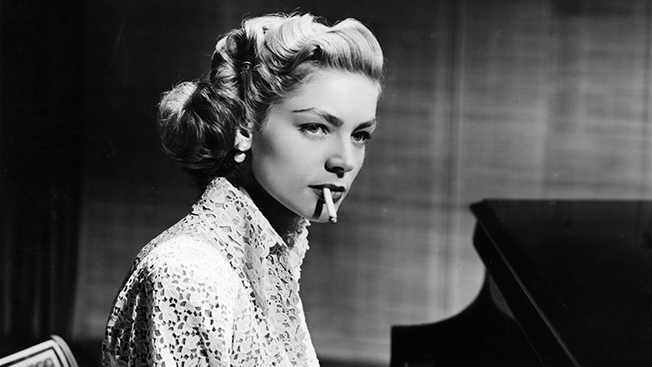 "I think there's every chance that we'll see Lauren Bacall again. Her career spanned many decades and her passing away will free up (with the consent of her estate) the choice of her personification. Of course, this has long been the case with the use of still images; but with recent technological advances and the fact that she had such a strong iconic image, I have no doubt that we will see her reappear on the screen. Last year, our VFX team pioneered a full CG face replacement to bring back Audrey Hepburn for a Galaxy/Dove chocolate spot. Recreating everything down to her iconic eyes and smile was a challenge, but the authenticity in the result was from a labor of love that clearly resonated with an audience that had come to love the actress for generations. Lauren Bacall's image certainly carries the same weight and will surely draw interest from brands, agencies and production shops." "Romanticized versions of silver screen celebrities still hold a special appeal. However, brands would be wise to align with the new breed of celebrity that better embodies the values of younger audiences. If we see Bacall reemerge in advertising, it would have to be in a redefined manner that is both relevant to the target audience and aligned with the brand values and promise. While Lauren Bacall’s brand is not as powerful or as legendary as screen sirens Audrey Hepburn and Marilyn Monroe, her husky voice was one of the most unique elements of her brand. This could pose an opportunity for marketers." "There is and always will be a commercial demand for the names and images of iconic individuals who have passed. Lauren Bacall won’t be any different. Much like famous quotes we so often find inspirational, images of iconic people have cultural cache. Sadly, we wait till they are gone before the value of such material is realized. Lauren and Robin Williams are both prime examples of that. Somehow I get the feeling this won’t be the last time we hear from either of them." "It comes down to creative integrity. When a famous person passes away it’s up to their family or foundation to protect the legacy. If those people are blindly turning over the star’s likeness for a dollar amount without any creative approval, it’s only a matter of time before the line is crossed."